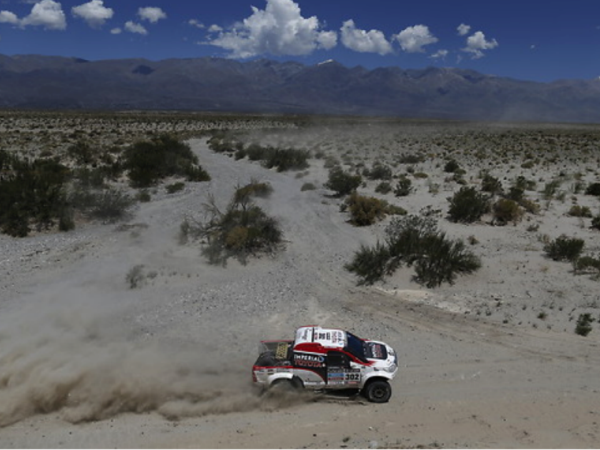 Two people following the Dakar Rally died when their vehicle overturned in rough terrain in northern Argentina. Police identified the pair on Friday as Agustin Ignacio Mina (19) and Daniel Eduardo Ambrosio (51). Police said the crash took place on Thursday at the end of the fifth stage. Police said Mina was covering the rally for a motor racing magazine, and they identified Ambrosio as a fan of motor sports. Argentine police offered few other details. The Dakar, raced over rugged terrain in difficult-to-control areas, often produces fatalities. Last year, French motorcyclist Thomas Bourgin was killed in a collision with a Chilean police car. Two fans also died in a collision between a support vehicle and two taxis.